When I first moved in with my boyfriend he kept trying to convince me to use his Philips Sonicare toothbrush as my back teeth were not in a great way due to my phobia of the dentist. For some reason the sound of it made me think it would rip my teeth out so I stuck to my good old manual brush, how silly I was! My own girly version of the latest Philips Sonicare Diamond Clean Toothbrush (Deep Clean Edition) in White & Rose Gold RRP £299.99 (it's currently on offer in places such as Boots & Argos for more than HALF PRICE). 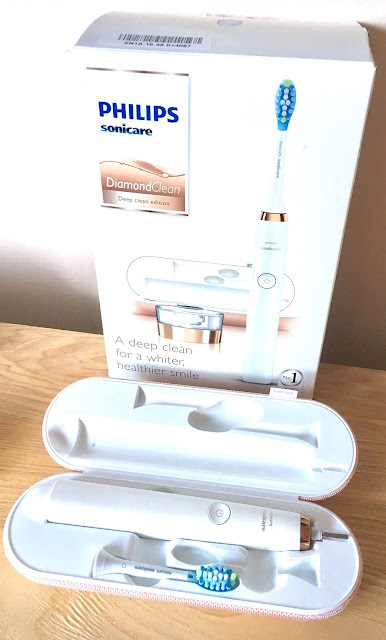 I can hear you all gasping at the thought of forking out £300.00 (or £150.00 if your lucky enough to get it while it's on offer) for a toothbrush but believe me, this toothbrush is a game changer. 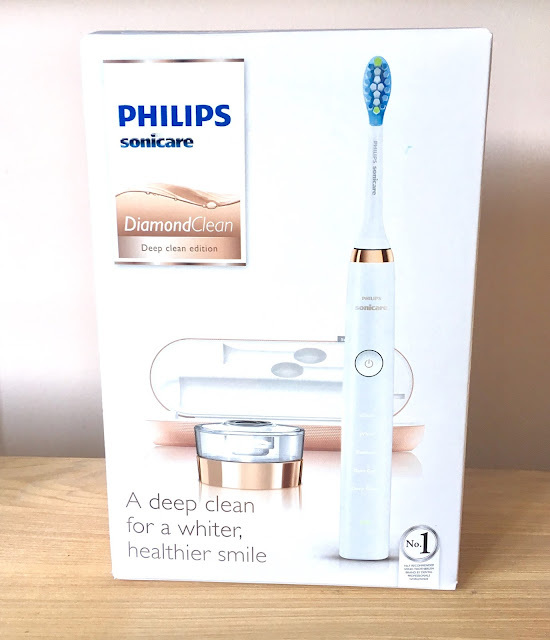 My teeth were stained in places on my front teeth and my back teeth were not in a good way at all as I had not returned to the dentist for the fillings I needed, but since using this electric toothbrush I have noticed a very big difference. "The Philips Sonicare DiamondClean helps you clean your way to whiter teeth in one week. Not only is the DiamondClean designed with style in mind, but it delivers on performance as it's clinically proven to remove up to 100 per cent more plaque even in hard to reach areas. It's designed to deliver superior results for a healthy smile. The range of five cleaning modes provides optimal cleaning between teeth and along the gum line. Daily use of the white mode can help you achieve teeth that are noticeably whiter in just one week." The visible stains on my front teeth have disappeared and the plaque build up on my back teeth has reduced drastically, so for me this is definitely worth the price tag, plus it's rose gold? Who doesn't love rose gold?! Inside the box you get absolutely everything you need to travel with it, keep it looking neat, tidy and pretty in your bathroom and every wire possible to charge it. 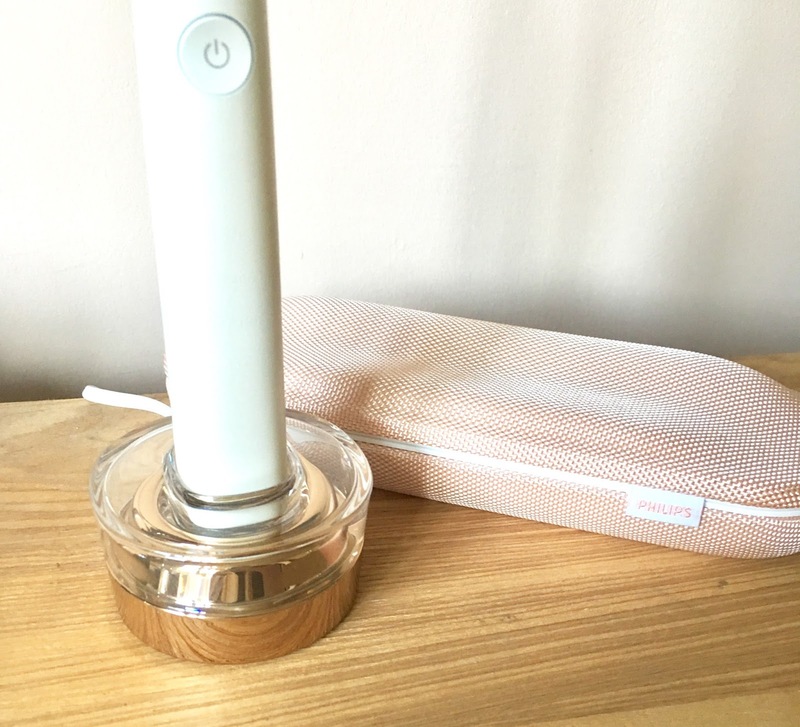 The rose gold charging station looks great and takes up no room at all as you simply stand the toothbrush in it (pictured above) and the rose gold carry case is sturdy and compact with enough room for an extra head in it. The brush comes with 5 different settings which makes it really versatile for anyone. 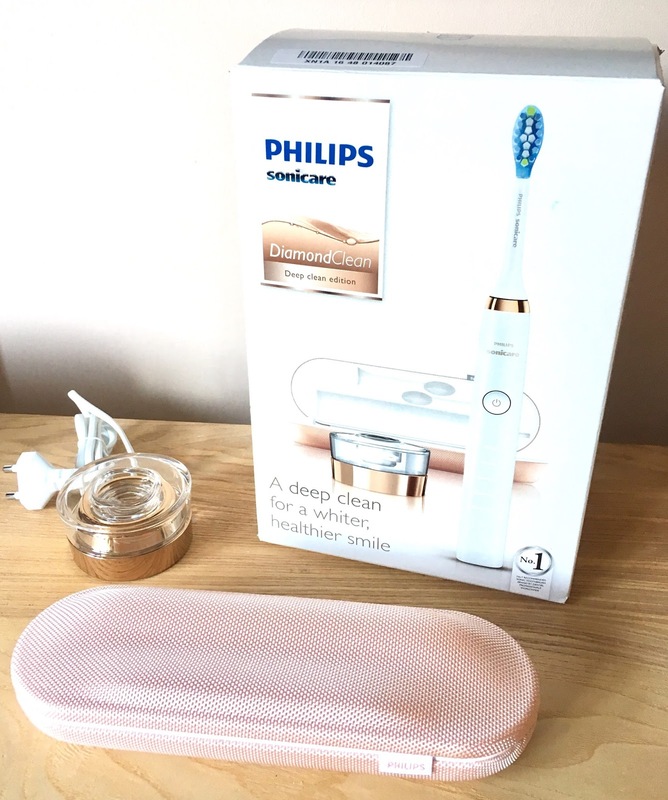 When I first started using my boyfriends toothbrush I used it on the sensitive setting as I found it quite hard on my gums as they weren't used to such a deep clean but now I use it on any setting. 5 cleaning modes: sensitive, whitening, deep clean. So next time you think about ordering some Crest strips on eBay (we have all thought about this or even done it) invest in a good electric toothbrush such as this one, you won't regret it. You will have whiter, cleaner and healthier looking teeth in no time at all! If my review isn't enough to convince you then have a quick search on the internet where you will find 5* reviews on websites like Boots and Argos too. What toothbrush do you currently use?